Miguel Almiron has all-but confirmed his imminent switch to Newcastle United after bidding an emotional farewell to Atlanta United. The 24-year-old, as we speak, is travelling across the Atlantic to finalise a move to Rafa Benitez's side - ending a month-long transfer saga. Thanks Atlanta for all the love I love you so much. Almiron has been continuously linked with a move to Tyneside in January, though, a deal was thought to have stalled over the MLS club's £20million+ asking price. However, news broke that the Magpies had met Atlanta's demands before the 2-1 win over Manchester City on Tuesday, a deal which is expected to break United's long-standing transfer record. The current record stands at the £16m paid to Real Madrid for Michael Owen in 2005. 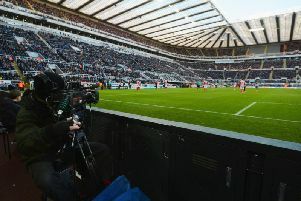 Given Newcastle fans had planned a sit-in protest against owner Mike Ashley following the conclusion of the City game, some supporters expressed their scepticism surrounding the timing of the Almiron announcement. But, the Paraguayan has eased those concerns by confirming his Atalanta departure via his Instagram account. An image also emerged this morning of Almiron posing for a picture with his agent at Atlanta Airport as he prepared to fly to the North East. In two seasons at the MLS side, Almiron clocked up 70 appearances and scored 22 goals - 13 of which followed last term as he helped Atlanta lift the MLS Cup for the first time.